PLEASE NOTE: If you received your timer after to April 1, 2015 please refer the series G blind and shade timer instructions. The instructions on this page are for series R timers, which have been superseded with series G. This page is here for legacy purposes. In part 1 we discussed how the MCT-1-RF wireless wall mounted timer can be used to activate our radio equipped blind and shade motors using RF (Radio Frequency). In part 2, we will become familiar with the layout of the controls and features of the display. At this point the timer cover should be removed, the battery inserted into the battery compartment, and the timer unit powered up with some characters on the display, as shown in the picture on the right. NOTE: After inserting the battery and activating the timer, please wait 5 minutes for the microprocessor self-check to complete and for the circuitry to stabilize, before entering any settings. Also, please note that the 'confirm' and 'limit' switches behave the same way as the switches of the same name on our regular remote controls. The picture below is a detailed view of all the characters and symbols that will be shown in the LCD liquid crystal display, at various different times during the programming process. The transmit symbol only appears when the timer unit is actually sending a radio signal to the tubular motor (or group of motors). 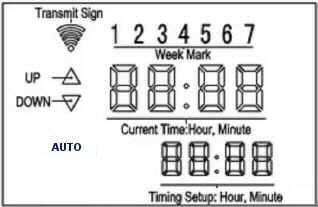 The day of week section is used to determine which of 7 days will be selected during the programming of the timer. The up/down indicators reflect the direction of travel when the motor is activated. The current time is a simple real-time digital clock, but it is also used to indicate which MENU mode has been activated, as per the table seen below. The mode indicator is used to determine if the timer is operating in manual mode (AUTO disappears) or automatic timed mode (AUTO appears). Use the MODE switch to toggle between automatic timed mode and manual mode. In manual mode, the Up/Down/Stop buttons can be used to activate blinds manually. The bottom right indicator displays the year setting when you are setting the time. The timer is able to memorize a total 18 different timing event triggers, organized in a sequential fashion from Monday to Sunday. The 'Timing Number' indicates which of the 18 timing programs is being used or set. The 'Timing Setup' shows the preset trigger time for a particular pre-programmed event. 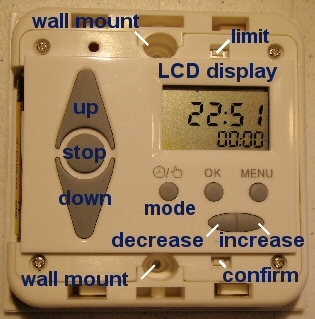 Normally the real time clock will display time and date information, but during the programming mode the clock display is converted to a mode indicator. There are 4 basic modes of operation as seen in the follwing table, and you should be able to press the MENU button and cycle through each of the different modes.